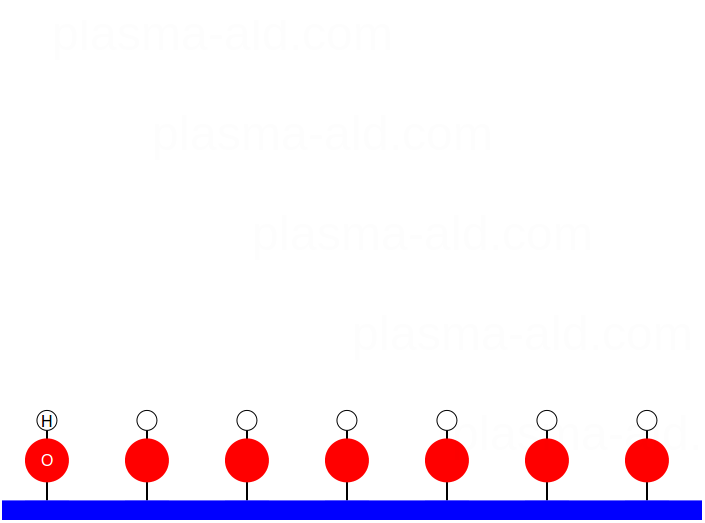 Below, basic introductions to ALD and plasma enhanced ALD are provided with links to more in-depth resources for further learning. ALD is a vapor phase thin film deposition technique that has gained considerable popularity in recent years. The following list of ALD benefits goes a long way towards explaining the broad popularity of the technique. Wide range of materials available including oxides, nitrides, sulfides, fluorides, metals, ternaries, quaternaries, chalcogenides, etc. Digital film thickness control with Angstrom level resolution. Excellent film uniformity even over large substrate sizes. Relatively low deposition temperatures with some processes available at room temperature allowing deposition on temperature sensitive substrates such as plastics. Moderate vacuum levels with some processes available at atmospheric pressure. Conformal coatings on high aspect ratio topographies. Excellent film adhesion to underlying substrates. Ability to mix different film chemistries to gain the advantages of doping and laminates. Relatively simple hardware compared to other thin film deposition techniques. ALD is typically carried out in a heated reactor that is being maintained at a sub-atmospheric pressure through the application of a vacuum pump and a controlled flow of inert gas, such as nitrogen, N2. Substrates to be coated with an ALD film are placed in the reactor and allowed to equilibrate with the reactor temperature before the ALD process is started. An ALD cycle consists of four steps. Below the four steps of the ALD cycle are described using the deposition of Al2O3 with TriMethylAluminum (Al(CH3)3, TMA) and water (H2O) as an example. At the beginning of the cycle, before the substrate is exposed to the first precursor, the substrate surface is covered with hydroxyl (-OH) groups. Typically a metal containing volatile precursor is introduced to the reactor. Precursor A reacts with active sites on the substrate surface. Precursor A does not react with itself in the gas phase or with the A chemisorbed to the substrate surface. This self-limiting process is key to several of the desirable ALD film properties such as conformal coating of high aspect ratio features, pinhole free films, and digital growth control. For the TMA + H2O → Al2O3 process, methyl groups on the TMA react with surface hydroxyl groups leading to strong, oxygen-aluminum bonds with methane given off as a reaction product. Sufficient TMA is introduced to the reactor to react with all available hydroxyl groups. Some hydroxyl groups will go unreacted due to steric interference from TMA chemisorbed at adjacent sites. The carrier gas is given time to remove excess precursor A and reaction products from the reactor. If the ALD co-reactant is introduced to the reactor before all of precursor A is removed, gas phase CVD reactions will take place. For our Al2O3 example, the first purge step removes any excess TMA and CH4 reaction product from the reactor prior to the introduction of the co-reactant. 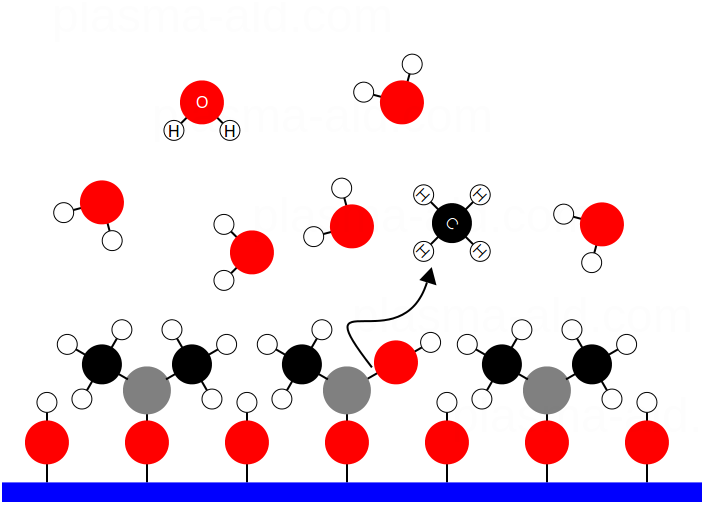 If the co-reactant (H2O) and TMA are both in the gas phase, they will react to form Al2O3 via CVD-type reactions which will deposit onto the substrate in a non-self-limiting fashion negatively impacting the desirable traits of the ALD films. After all of the precursor A and reaction products have been purged, the substrate is prepared to be exposed to the co-reactant. Not every active site will be utilized due to the steric hindrance of precursor ligands on adjacent sites. In our example, the methyl groups on the chemisorbed TMA may physically block another TMA from reacting with an adjacent -OH group. ALD films tend to grow at rates substantially below the true monolayer thickness for a given material. Processes utilizing bulkier precursors will have slower growth per cycle rates compared to processes using physically smaller precursors because the bulkier precursor ligands block more active sites. A co-reactant is introduced to the reactor which reacts with chemisorbed precursor A, again in a self-limiting manner, to provide the desired film. Precursor B will also leave the surface prepared to react with another pulse of precursor A. For the TMA + H2O → Al2O3 process, H2O reacts with methyl groups on the chemisorbed TMA releasing methane and leaving the surface covered in hydroxyl groups, just as was seen prior to the initial TMA pulse. Sufficient H2O is introduced to the reactor to react with all available methyl groups. Purge, to remove excess precursor B and reaction products from the reactor. Gas phase reactions will lead to CVD-like behavior, so there should be no precursor B in the gas phase when precursor B is introduced to the reactor. For our Al2O3 example, the second purge step removes any excess H2O and CH4 reaction product from the reactor prior to the introduction of the TMA. 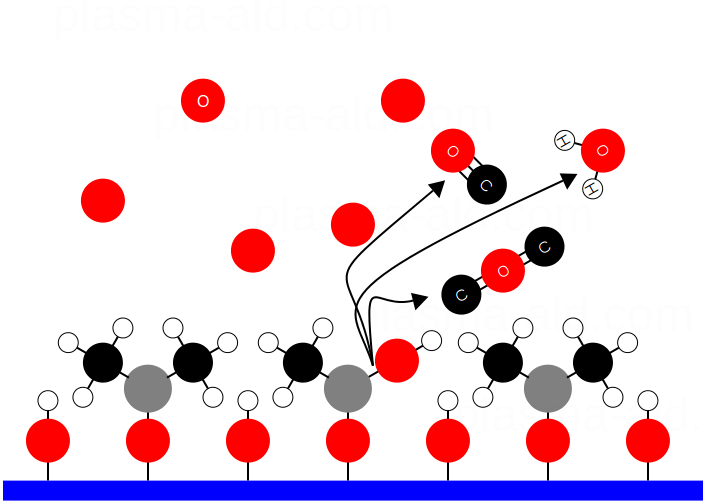 If the co-reactant (H2O) and TMA are both in the gas phase, they will react to form Al2O3 via CVD-type reactions which will deposit onto the substrate in a non-self-limiting fashion negatively impacting the desirable traits of the ALD films. Compare this picture to the one from the beginning. Like the surface prior to the precursor A exposure, the surface is covered in hydroxyl groups, but now there is a new sub-monolayer of Al2O3 where the previous layer of hydroxyl groups was. After step 4, the substrate surface looks just very similar to prior to step 1. 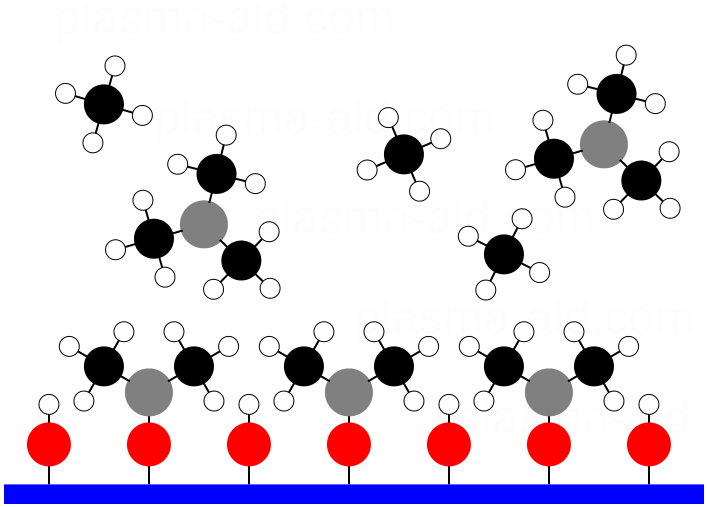 In our Al2O3 example, after the water purge step is completed, the surface again is covered in hydroxyl groups, just as it had at the beginning, ready for the next pulse of TMA. The hydroxyl groups may look tightly packed together and blocking each other, but that is due to the limitation of our simplified two dimensional representation of the process. This basic form of ALD, in which molecular precursors react on the surface of a heated substrate is often referred to as thermal ALD. To learn more about thermal ALD consider these review papers. While the TMA/H2O process for Al2O3 appears rather simple, there are a lot of process details which impact a range of film properties. Hundreds of publications exist for the TMA/H2O ALD process for Al2O3 exploring these further process and film property details. Deposition conditions including temperature, gas flows, TMA and H2O dosing, precursor purity, pressure, substrate material and topography, and post-deposition anneal can impact important film properties such as deposition rate, dielectric constant, leakage current, breakdown voltage, barrier properties, film density, uniformity, etc. And this is for one of the best behaved and understood ALD processes. No precursor has been identified for the material of interest. Potential precursors exist but are insufficiently reactive with typical, thermal ALD co-reactants. Thermal ALD processes exist but produce unacceptable results at lower temperatures. Increasing the reactivity of the ALD co-reactant is one route to addressing the above issues. Many early ALD researchers had their roots in semiconductor processing, which often involves the use of low temperature plasma processing for thin film etch and deposition applications. Plasmas are low pressure gases that have been partially ionized through application of an external power source. High energy electrons in these plasmas can be used to disassociate molecular feed gases into highly reactive radical fluxes (ie. O2 + e-→2O*). Plasmas enable adding lots of reactivity without adding lots of heat. Radicals are many times more reactive than molecular co-reactants and can improve the ALD process in several ways. 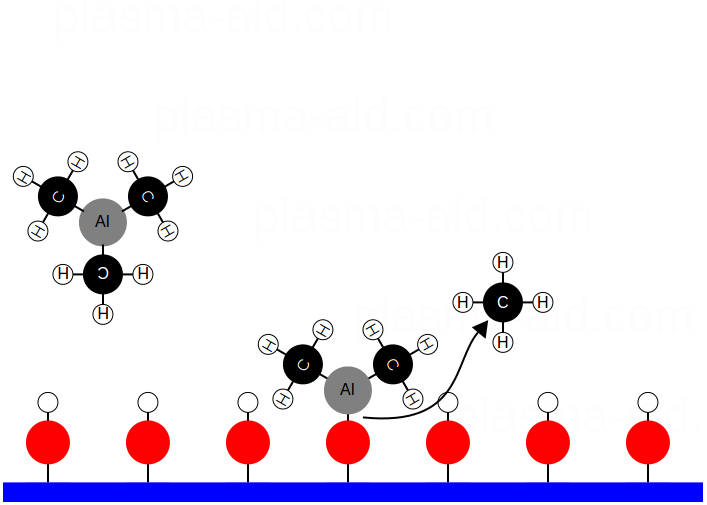 If we replace the thermal ALD H2O pulse step with an O2 plasma step, a flux of O* radicals will be incident upon the substrate surface, reacting with the methyl groups in a combustion-like process. The surface chemistry for the plasma process is not nearly as clean as that for the thermal ALD process. It is not obvious what should be the state of the substrate surface following the O2 plasma step as compared to following the H2O pulse step in the thermal ALD process. 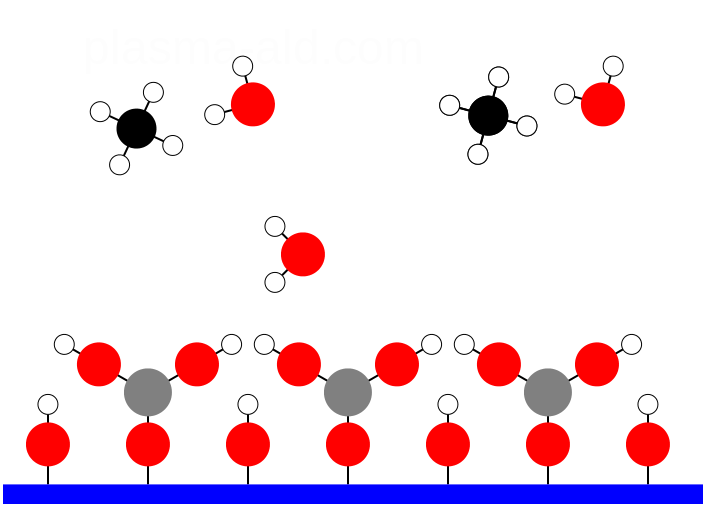 Surface analysis indicates that the surface of the depositing Al2O3 is again covered in hydroxyl groups, perhaps aided by the H2O produced by the combustion of the methyl groups. What does the plasma step gain us? Improved film properties due to more complete reaction with depositing film and precursor ligand removal. More film options as precursors un-reactive to molecular co-reactants become available. Reduced purge times, particularly at low temperatures where thermal co-reactants (ie. H2O) require long purge times. Plasma or Radical? Enhanced or Assisted? Direct or Remote? Deposition or Epitaxy? 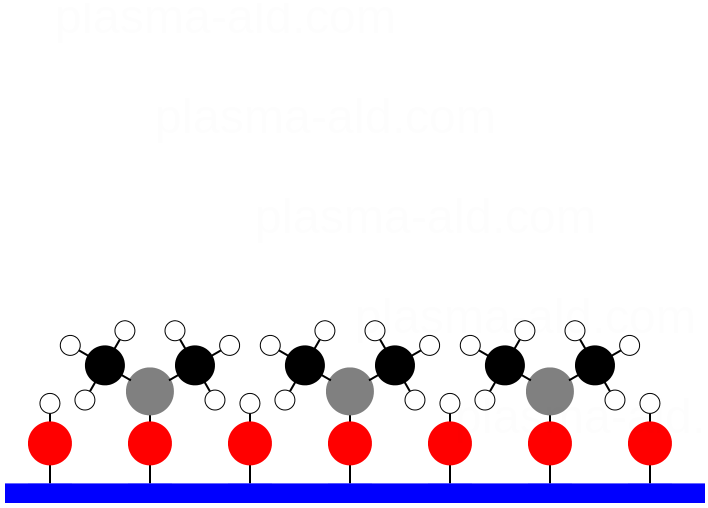 This modified ALD processing in which the co-reactant step is replaced with a plasma step can be traced back to the 1990's, but has exploded in popularity since the mid-2000's. Depending on who you ask and the details of hardware and processing conditions, this technique goes by various names. Whether or not the process is called "Plasma" or "Radical" depends on if the substrate is in contact with the plasma or not. 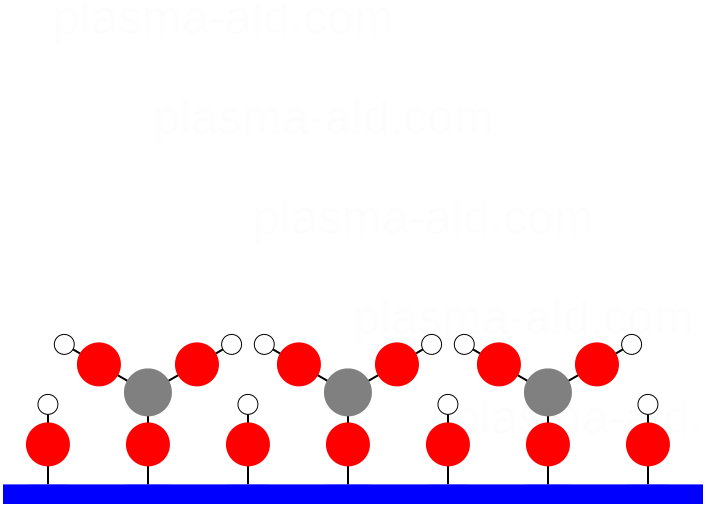 "Plasma" processes are sufficiently coupled to the plasma source that some amount of substrate ion bombardment is likely. "Radical" processes have the substrate sufficiently removed from the plasma source that substrate ion bombardment is very low and only the longer-lived radical flux is incident upon the substrate surface. Although there are different names, and they refer to subtly different processing conditions, it appears as if the research community has primarily settled on collectively referring to all these types of processing as PEALD. To learn more about plasma ALD consider these review papers.